Only the GOP can save (or destroy) democracy in America. 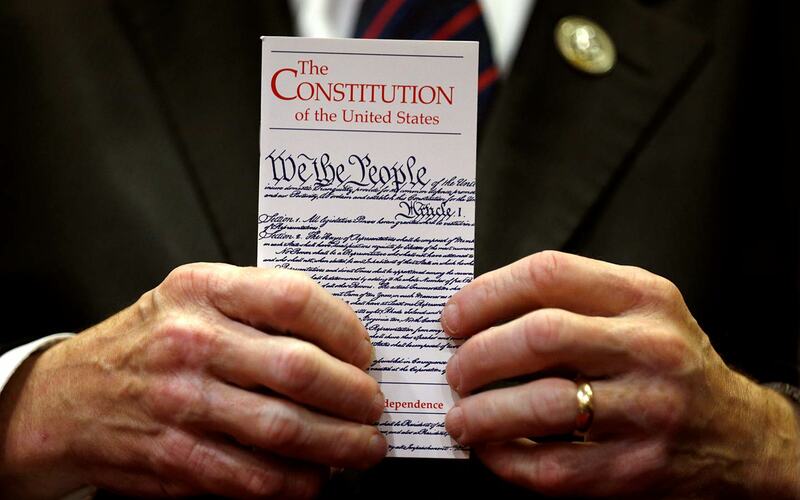 What does it mean to be against the Constitution? American history has no precise analogy to the early-20th-century fascists who ran against the nascent democracies of the inter-war years. Indeed, if there is an American who unequivocally styled himself an anti-constitutionalist, it would be the abolitionist William Lloyd Garrison, who declared the document that enshrined slavery a “covenant with death” and an “agreement with hell.” Lacking a long tradition of anti-constitutional politics, Americans might be forgiven for thinking it was not a real possibility. But in the United States, there is a budding political movement that sets itself against a basic constitutional principle. This movement has a highly salient national leader, a coterie of intellectuals, and a deep reservoir of latent support, waiting to be tapped. Even if its current avatar flames out, it will endure—pressing its core objection to a fundamental tenet of the Constitution: democracy. The Constitution, from its very inception, has envisaged an elected, representative government, one that is subject to removal at the polls. A democratic architecture arcs through most of its first two articles. Various amendments extend the franchise across race, gender, wealth, and age boundaries. In practice, moreover, the United States has hewed to the Constitution’s timetable for democratic elections for more than two centuries. No other country can say as much. This is hardly to say that our democracy today—with its massive and racially lopsided disenfranchisements, exorbitant spending, and two-party duopoly—is anywhere near ideal. It is rather that the aspiration of democracy, if realized with lapses and blind spots, is laced into the Constitution’s bones. The Trump White House is, obviously, the polluting, pullulating engine of contemporary anti-constitutional postures. I speak not here of its casual disregard for ethics laws and rules, its contempt for the Equal Protection Clause, or the outright hostility to the speech rights of those who won’t stand for the national anthem. Rather, the most revealing display of the Trump doctrine, to my mind, was the candidate’s never-materialized threat to reject the election results if Clinton won. It was a refrain filled with disdain not just for the Democratic candidate but for the system of democratic choice. Much as he would like to think otherwise, Trump is nothing new in this regard. He is what Princeton political scientist Jan-Werner Müller calls a populist: Someone who claims to vocalize the sole, authentic voice of the people, and someone who characterizes all dissent as the canker of a traitorous elite. Trump stands only as the latest strain in a familiar democratic metastasis. Yet earlier iterations of populism have not prevailed simply by the sheer momentum of a leader’s charisma. Rather, they have burst democracy’s bounds because an entire political movement—a faction or a party—has repudiated the logic and legitimacy of democratic competition. The lesson of populism elsewhere in the world is that it is necessary to look closely not just at the actions of a putative leader but also at the social and political formation at his back. In other words, Trump alone is not enough. To threaten democracy, he requires a friendly party in the House and Senate—one that would remove constraints on the White House by terminating oversight, undermining independent institutions, and attacking critics, while at the same time stacking the federal judiciary with fellow travelers aligned personally and ideologically with the president. Having won narrow victories in national polls, both Fidesz and the PiS eliminated judicial checks and turned the bureaucracy into an instrument of state power. Public-service broadcasting in both countries has been twisted into a narrowly partisan tool. In Hungary, the electoral system has been changed to sap the opposition’s ability to win a new majority. The Fidesz government has also moved with its regulatory powers to shutter opposition broadcasters and hostile elements of civil society, such as Central European University. In Turkey, the government forced unfriendly newspapers to close, and sidelined its critics with charges of sedition (which, to be fair, were not always unfounded). In all of these cases, it has been a broad political movement with substantial support in religious and conservative civil society—and not just a single leader or clique—that has been instrumental in suppressing democracy. In each case, the party has run against not just another party but the constitutional system as a whole; political scientists thus label them anti-system movements. And when in power, they move quickly to dismantle key elements of that system. It is not partisan gamesmanship to ask whether the Republican Party, despite its rhetoric, can be characterized as an anti-system, anti-Constitution party. The GOP controls the White House, both chambers of the national legislature, and more than 60 percent of statehouses. It has also appointed a majority of justices on the Supreme Court. There is evidence in the public statements of politicians, intellectual ferment, and raw polling data that an anti-Constitution position is emerging. It is too early, I think, to say it has consolidated into a movement committed to maintaining power by eliminating meaningful political competition. But the recent Republican efforts in North Carolina to racially gerrymander and legislatively eliminate gubernatorial power after losing that office give us a taste of what such a campaign might look like. Consider first the strategic decisions of Senate majority leader Mitch McConnell since he declared in 2010 that the Republican Party’s “single most important” priority was making Barack Obama a one-term president. Since then, he has led congressional Republicans twice in exploiting the statutory debt ceiling to threaten national default as a way of extorting policy concessions. He then subtly reworked the xenophobic tropes of the “birther” movement into a more neutral-seeming ground for impugning and denying Obama’s legitimate authority as president to appoint a Supreme Court justice. Finally, there is his evisceration of the Senate filibuster for high-court nominations, and the extravagant use of reconciliation to enact substantive legislation without hearings, debate, or any opposition input. All this is consistent with a party willing to dispense with the ordinary to-and-fro of democratic politics—and go for broke. Across potentially influential intellectual figures on the hard right, then, we can find a growing skepticism of democracy. The implication that one might forgo democracy—rather than committing what Anton and Buchanan characterize as a form of cultural suicide—hovers like a specter in the wings, awaiting its final cue. Many ideas, of course, circulate. Not all take root. But on the political right there is a growing mistrust of democracy. In an August 2017 poll, more than half of Republican-leaning respondents said they would support efforts to postpone the 2020 election if Trump said it was necessary to ensure that only eligible voters could participate. It is worth wondering what the result of such a poll would be if the question were instead whether to hold an election in the shadow of an expected war or terrorist attack. The annual World Values Survey provides yet more evidence that anti-Constitution arguments may yield increasing returns today. This survey, deployed with the same questions since 1981, provides a window into changing public attitudes. During the past three decades, it shows the proportion of US citizens who say they believe it would be a “good” or a “very good” thing for the “army to rule” has spiked from one in 16 to one in six. Among the cohort of “rich young Americans,” the proportion of those who look favorably on military rule is more than one in three. Couple this hostility to democracy alongside a worrying lack of public knowledge of what the Constitution says, and the public foundations for democracy start to look increasingly shaky. It is, in short, a mistake to think of the threat that Trump poses to American constitutional democracy in isolation. The risk is mainly a function of how a larger and yet still inchoate intellectual and political movement within the Republican Party develops. Although Trump’s actions prime the pump, a vengeful and retrograde nationalism flows through the GOP more generally. For better or worse, progressives have little or no immediate influence over these forces. But they cannot ignore them—lest their efforts to rebuild a political platform, reinvigorate communities that didn’t turn out in 2016, and peel away voters who defected from Obama to Trump end up for nothing. Rather, we must attend not only to what is happening in the Oval Office and the president’s Twitter feed but also on the broader retrogressions within the Republican Party.